Would the Matildas have won had they played on real turf? 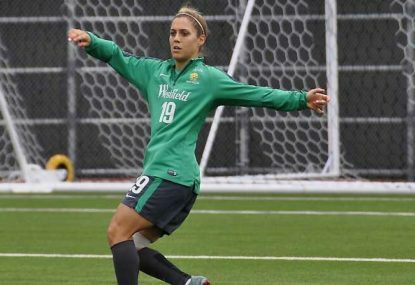 Katrina Gorry scored a clutch goal as the Matildas defeated Japan 3-1 in their bid to qualify for the Olympics. The dream is over for the Matildas, but what a great tournament they had. One thing of note was the fact they played their game against Japan on a synthetic pitch, in temperatures reaching 40 degrees. While both sides were dealing with the heat, reports came from Edmonton that many of the girls had problems with the synthetic pitch, or at least the heat generated by it being transferred through the sole of their boots. Many returned from training with icepacks on their feet and legs, as they experienced what falling onto a synthetic carpet can do to you. The introduction of synthetic turf to our game is a practical one, allowing play during all types of weather conditions, but it comes with frailties. I suspect injuries have increased playing on this surface, particularly when factoring in burns from your flesh meeting the ‘turf’ at speed. Football was not designed to be played on artificial turf and the authorities should get rid of them. You won’t find a creditable league across the world playing their competition on the surface, yet FIFA sanctioned its use at the Women’s World Cup in Canada. Two English League sides in the late 80s introduced a synthetic pitch and played home games on it. The FA were quick to abolish that caper and made the sides dig it up and revert to grass. With the improvements in turf technology, most teams in most leagues play on what I would call carpets compared to the days when I played, so there’s no reason to change the game as we know it by playing on synthetic turf. Apart from the obvious danger to players there’s the way the ball performs – its bounce and speed across the turf. Then there’s the fact that attempting to cross a ball and getting your foot under the ball on that surface can be difficult. I see players in the A-League constantly unable to beat the first man from corners or set pieces, perhaps they’ve been training on synthetic pitches? Turf is also unpredictable on the body. Defenders can apply a slide tackles on grass knowing there’s no danger of your dermis being ripped off your leg. When you stop abruptly on turf there’s give in the ground, which cushions the action and helps with less stress on ankles and limbs. If you fall on synthetic turf there’s plastic and underneath that a bloody great concrete slab, which doesn’t give at all. As for the Matildas, we’ll never know what could have happened if they had met the Japanese on a real park instead of a plastic one.